Tom Djll studied music at Berklee School of Music, the Colorado College, the Creative Music Studio, and Mills College with Anthony Braxton, Roscoe Mitchell, Karl Berger, Lester Bowie, Leo Smith, George Lewis, Pauline Oliveros, Alvin Curran, and many others. He is the recipient of a Masters degree from Mills College in Electronic Music as well as a Deeploma from the Deep Listening Organization, and was awarded the Paul Merritt Henry Prize for Composition while at Mills. Tom has led improvising workshops and in 2004 completed a monthlong residency at Mills College, focusing on extended techniques. 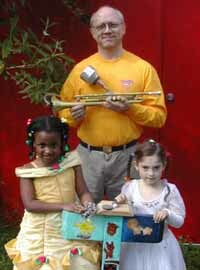 Tom has spent over twenty years developing the trumpet’s wide sonic array of extended techniques. His musical language incorporates complex noises and gritty, unheard textures from electronica into melodic gestures and building asymmetrical formal structures. Tom has made a lifelong study of the art of improvised music, and has been actively performing since 1980. He has performed with Gianni Gebbia, Steve Adams, George Cremaschi, Eugene Chadbourne, Natsuki Tamura, Andrew Voigt, Biggi Vinkeloe, Chris Brown, Ignaz Schick, Fred Frith, The Splatter Trio, Gail Brand, matt ingalls, Wolfgang Fuchs, Tim Perkis, William Winant, Toshi Makihara, Jon Raskin, Phillip Greenlief, Pauline Oliveros, “Blue” Gene Tyranny, nmperign, Jack Wright, Miya Masaoka, Luc Houtkamp, Tatsuya Nakatani, and many others. Tom appears on recordings with Wolfgang Fuchs, Gino Robair, Tim Perkis, John Shiurba and Matthew Sperry (Six Fuchs, Rastascan), Miya Masaoka, Vijay Iyer and others on Rastascan’s Sun Ra tribute album Wavelength/Infinity, on Chris Brown’s LAVA (Tzadik) and Duets (Artifact), and on Jack Wright’s Signs of Life (Spring Garden) and 8X9 (Limited sEdition). Tom’s solo Blasted Rustbucket is disc 33 of the Artship series. Tom also occasionally writes about music for The Wire, Signal To Noise, One Final Note, Musicworks, and other publications. Tom Djll was a founding partner of Odwalla, Inc. and currently a partner and Art Director at Mythmaker Creative Services.